It is parked in … bucket, since its overall width does not exceed the height of an eight-year old child. He sets aside the heating oil he will spend a household in Nevrokopi during the months of gravity. It charges to the simple “socket” socket of a home, with what it requires in an electric load to operate a vacuum cleaner, and its cost only costs one euro per 100 kilometers. While being built in a large unit in the world’s capital of electrification, the vast China, its “heart” beats with Greek know-how. 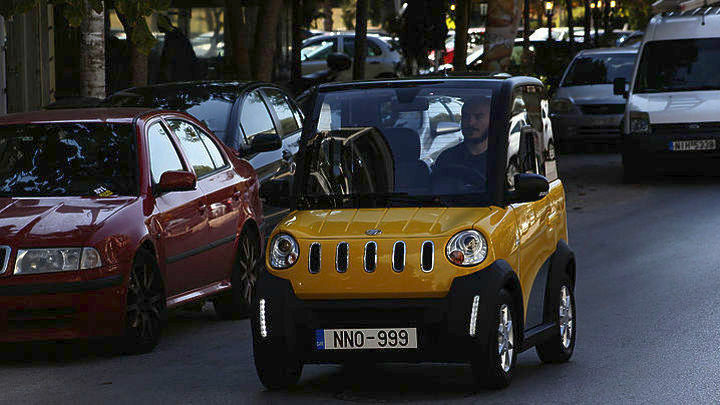 The reason for Ecocar, a purely electric two-seater city car, with batteries, controllers and electric subsystems of Greek know-how, is expected to circulate more massively in the Greek and European markets in 2018. Although he made his debut just last September, during the 82nd International Thessaloniki Exhibition, he has already had an “unexpected number of orders”, as well as a number of sales that took place before the expense of the International Exhibition and Congress of Helexpo SA, to formally appear on the streets. Two models of the Greek-Chinese vehicle, which have been licensed for circulation in Greece and Europe, have been classified. “Ecocar certainly will not … fire on the asphalt, but you will do your job dignified with it, at low cost and with environmental friendliness. With a small photovoltaic installation, the cost of operation can be completely zero, “notes Mr. Kazantzidis.